This past Saturday morning The Heartbeat of Haverhill headed downtown and stayed until the sun began its retreat. There was just so much to do. There are dozens of exceptional holiday events in Haverhill, so many that you can find yourself in need of a few fast flying reindeer to visit them all in just one day. Odd friends….How can you ever find a gift to match the quirkiness of their tastes, the expansiveness of their interests, their zest for all things unique? At 93, how great is it to feel life still holds happy surprises? 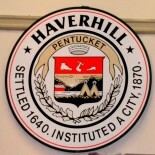 The Heartbeat of Haverhill actively seeks out reasons to be happy for this season. The Heartbeat of Haverhill holds a special place in our heart for the vastness of our agriculture most specifically at this time of year for the multitude of Christmas tree options. Haverhill’s small but integral role in the Salem Witch Trials. A decision, though made almost 400 years ago, is a timeless display of honesty, integrity and selflessness despite the potential peril to one man’s reputation and business.